The only reason I went to see this movie is because I always root for Ryan Reynolds. If it had not starred Reynolds, this movie would have been on the cutting block for me. The trailer was a joke. Was anyone impressed with the nonsense that this movie was trying to market? Although I had my doubts, I was still hoping that the movie would prove to be far better than the theatrical trailer…but it wasn’t. I’m not the biggest fan of Ben Kingsley in films. I find it hard to take him seriously. I was starting to think this movie was a comedy just because Kingsley was cast…smh. Kingsley opens the film and I was less than intrigued by what was taking place. The story seemed a little rushed and there was very little development before Reynolds came into play. The story just seemed to drift with interruptions of nonsense here and there. What annoyed me most was the actress who played Reynolds wife. She played the same character in Elysium, with a sick child she was caring for…Ugh! She added nothing exciting to the story, and only seemed to slow it down. 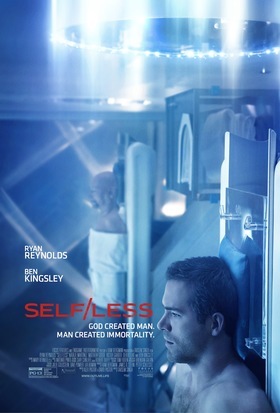 This entry was posted in Uncategorized and tagged Ben Kingsley, Derek Luke, Ryan Reynolds, science fiction thriller, Self/Less, Victor Garber. Bookmark the permalink.